In apparently a setback to the top drawer sportsmen of the region, the organisers of the forthcoming International Kabaddi Cup, three matches of which are to be played here on November 3, have decided to confer the status of ‘Guests of Honour’ and ‘Chief Guests’ to political figures leaving top level sportsmen flummoxed at the development. Recently launched 108 Emergency Services (Ambulance) in the State has been emerging as a Good Samaritan for the expecting mothers as well as for the new born children. Since its inception in the state in April this year, 108 ambulances have handled thousands of pregnancy cases and its medical technicians have extended quality medical care to women to deliver in the emergency vehicle itself. Asia’s largest citrus nursery spread over sprawling 25 acres of prime land and boasting of one of the best green houses of the times to nurture citrus plants has apparently hit bad times as it has been lying dysfunctional for past two years. The Punjab government was planning to hand it over to the Punjab Agriculture University, Ludhiana. The local Municipal Council has accused Tara Singh, a local SAD leader and District President of the Cooperative Labour Contractor Union of ‘taking away' as many as 5 envelopes containing tender forms submitted by various cooperative labour contractor societies and contractors for the various development works. This caused hindrance in the official procedure of opening of the tenders here on Tuesday. The police has solved the death case of Canada-based NRI Gurmohan Singh Sandhu (brother-in-law of High Court Judge Ranjit Singh). The police has booked two persons, including a BJYM leader, Satinder Singh Babba, of nearby Nangal Majha village and his friend, Sarabjit Singh of Chhokra village, under Section 302 of the IPC. Pandit Rao Dharennavar, from Karnataka, and who is an Assistant Professor at Sociology Department in the Government College, Chandigarh, got his book ‘Purandar Das’ released by children of the Anand Modern senior secondary school here today. Pandit Rao has already translated some Punjabi religious scriptures to his native language. Hoshiarpur is the only district in Punjab which has been selected under the Backward Region Grant Fund (BRGF) by the Union Ministry of Panchayati Raj. Disclosing this in a meeting of the District Planning Committee here today, Deputy Commissioner Dipinder Singh said the Union Ministry for Panchayati Raj was providing Rs 15.80 core annually till 2009-10. Eight out of a total of 11 MLAs of this parliamentary constituency have been adjusted as guests leaving scores of international sportsmen of the region fuming with anger. The organisers have decided to welcome Speaker Nirmal Singh Kahlon, Cabinet Minister Balbir Singh Bath and Dinanagar MLA Sita Ram Kashyap as Chief Guests for the Norway versus Spain encounter. Agriculture Minister SS Langah, Batala MLA Jagdeesh Sahni and Qadian MLA LS Lodhinangal will be the guests for the Italy versus Argentina match while Education Minister Sewa Singh Sekhwan and Gurdaspur MLA GS Babbehali will watch the proceedings from the guests’ box during the Pakistan versus USA contest. “To make matters worse, these elected representatives can not tell the difference between a baseball and cricket bat yet it is these very politicians who hog the limelight,” disclosed an international sportsman. Interestingly, the name of Gurdaspur Member Parliament Partap Singh Bajwa is not on the organisers’ invitation list. Last year too the MP was not invited following which the then Vice Chairman of the Organising Committee Sikander Singh Malluka had to issue a clarification. Record procured by The Tribune revealed that in the last six months (May to October 28), 108 emergency services handled 18,311 pregnancy cases. As many as 76 babies took birth inside the ambulance. 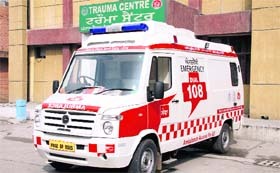 Chetan Sharma, Manager of Operations 108 Emergency Services, Punjab, said ‘108 ambulance’ services has become a big hit, attending hundred calls related to labour pain in a day. In cases of advanced labour, the team of Emergency Medical Technicians (EMT), who have been fully trained to handle pregnancy cases, have helped women to deliver babies in the ambulance. Out of 20 districts of Punjab, maximum calls came from Ferozepur district (2576), followed by Gurdaspur (2151), Amritsar (1575), Tarn Taran (1331), Mansa (1218), Sangrur (1205), Ludhiana (1162), Muktsar (950), Faridkot (869), Kapurthala (725) and Jalandhar (590). All other districts of the state received less than 500 calls with Fatehgarh Sahib district registering only 177 and Hoshiarpur just 269. 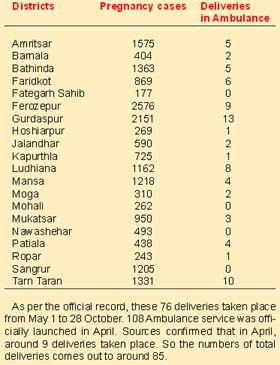 About number of deliveries that happened inside the ambulance, Gurdaspur left other districts behind with total 13 deliveries registered, followed by Tarn Taran (10), Ferozepur (9), Ludhiana (8), Faridkot (6) and Bathinda-Amritsar (5 each). Other districts registered below five deliveries. Sangrur, Nawashahr, Mohali and Fatehgarh Sahib Districts have registered zero deliveries in emergency vehicle. “Our primary aim is to ensure institutional delivery in a more hygienic process and in case labour pain increases, our fully trained staff turns the ambulance into a mobile labour ward to let the women deliver in the vehicle,” Chetan said. Out of 17 ambulances, Jalandhar, Bathinda and Ludhiana districts will get eight, four and five ambulances, respectively. Chetan Sharma, Manager Operations 108 Emergency services, said that Punjab has in total 223 (108 ambulances) and department has envisaged 240 ambulances (one ambulance for every 1.20 lakh population). Asia’s largest citrus nursery spread over sprawling 25 acres of prime land and boasting of one of the best green houses of the times to nurture citrus plants has apparently hit bad times as it has been lying dysfunctional for past two years. 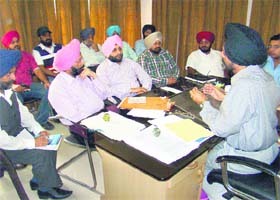 The Punjab government was planning to hand it over to the Punjab Agriculture University, Ludhiana. A proposal to this effect has been made and it was to be appoved by the Punjab cabinet, official sources revealed. The fund-starved nursery was started by the Congress government in 2003 with an objective to bring and nurture best available citrus varieties to improve the citrus stock of Punjab. The nursery was instrumental in disbursal of lakhs of citrus plants among farmers of the state, particularly, those of the citrus belt of Abohar-Bathinda and that of Kandi areas of Hoshiarpur district. The nursery has of late hit a rough patch as it has virtually been dysfunctional after expiry of the lease arrangement with PEPSICO in 2009. It was the private beverage company that ran the affairs of the vast nursery till the expiry of its lease with the Punjab government in 2009, sources in the Citrus Council said. A visit to the citrus nursery here presented a shocking picture. The net house, which was set-up to nurture ‘mother citrus plants’, was damaged about two years ago by gusty winds. Nothing has been done to get the net house repaired or replaced with new meshed sheets. 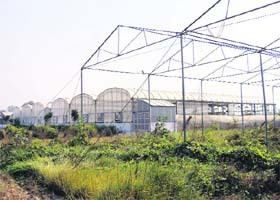 “Once touted as the most-modern automated climate-controlled green house that could accommodate as many as four lakh root-stocks of citrus plants, has been lying sans any use for over two years,” pointed out officials. “We are facing an acute shortage of funds to run the nursery. We need at least Rs 50 for each of citrus plants to be developed here,” said the Punjab Citrus Council CEO Sanjay Budhraj. He said apart from providing lakhs of citrus plants to farmers of different areas of Punjab, the nursery was instrumental in providing the Citrus Council more than six lakh citrus plants. BS Bajwa, Senior Manager with the Citrus Council, said in spite of expiry of the lease, officials at the nursery was busy developing and nurturing a number of citrus varieties like Daisy Tangerine, Trovita, Midnight and Early Gold with the available meager resources. Tejinder Singh, Assistant Municipal Engineer of the local Municipal Council, in a written complaint submitted to the SHO(City), Jiwan Kumar, stated that Tara Singh had allegedly took away 5 out of the total 8 envelopes lying at the table of the diary and dispatch clerk. Contractor Society, has not been entertained the PWD (B&R)", alleged the MC officials. Tara Singh, when contacted on phone, said, "As district president of the cooperative labour contractor societies, I have received complaints from the different societies and contractors that the MC officials have been demanding commission for allotting tenders. I went to the MC office to talk to the officials and made it clear that no commission would be paid to them." He added that the MC officials fabricated baseless allegations against him. Jiwan Kumar, SHO (City), said the police had received the complaint and started investigations. Gurmohan fell unconscious after consuming cold drinks with the said accused. The DSP, Sandeep Sharma, said the dead body was sent to the local Civil Hospital for post-mortem examination, which was conducted on May 20 and the viscera was sent to Kharar Lab for chemical examination and some of the body parts to the Amritsar Medical College for pathological examination, which found pesticides in the blood and body and confirmed that the cause of the death was pesticides. Pesticides was also found in the cold drink bottle. After detailed investigations, police succeeded to solve the case and booked both the accused, but no arrest has been made so for. Sandhu came to his native village, Uchapind, in May to visit his relatives. His brother-in-law, Dr RPS Virk, a renowned surgeon of the town, lodged a complaint at police station stating that Gurmohan came to their house on May 19 at around 1.45 pm he said he was going to Chandigarh for some work. Both the alleged accused brought Gurmohan to hospital at 4.15 pm in an unconscious condition and said three of them were having cold drinks in a complex of local Urban Estate when Gurmohan suddenly collapsed and immediately fell unconscious. Gurmohan died in the hospital. Earlier, two of his books were released by the Punjab Governor, Shiv Raj Patil, at a function held in Chandigarh, recently. Speaking on the occasion, Pandit Rao said his love for Punjabi arose when he started facing problem in making students understand lessons in English at his college in Chandigarh. "Not all students followed lessons given in English. It was here that I felt the need to learn Punjabi myself and then teach students. Within a few months, I mastered the language and since then I have been teaching in the same language," he said. But on account of increase in the population, the said Ministry will provide Rs 16.80 crore annually under the Twelfth Five Year Plan (2012-13 to 2016-17). The BRGF had been prepared by the Union government and according to the recommendation of above said Ministry all the pending works would be completed under the scheme very shortly. The funds would only be utilised for the improvement of existing infrastructure. Eighty per cent of the total money would be spent in rural development and remaining 20 per cent would be spent in urban areas. The entire money received under this scheme would be spent in 9 towns and 1367 villages of the district.